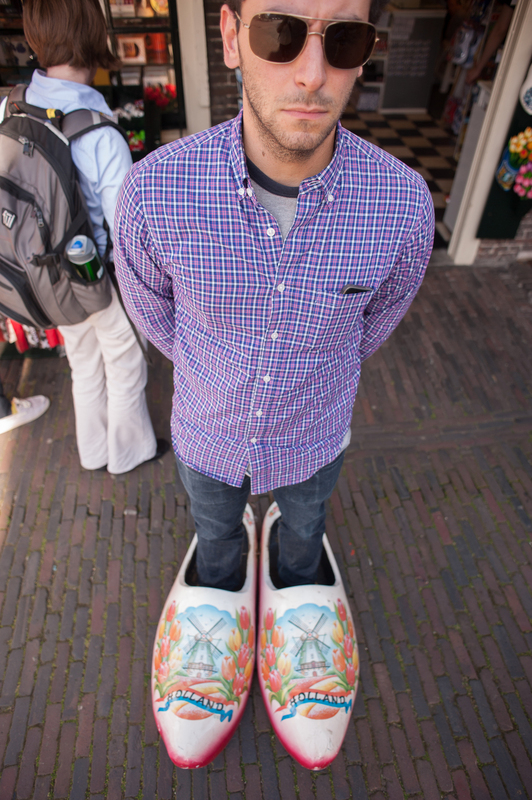 A trip to Haarlem was the highlight of our fourth day in Holland. 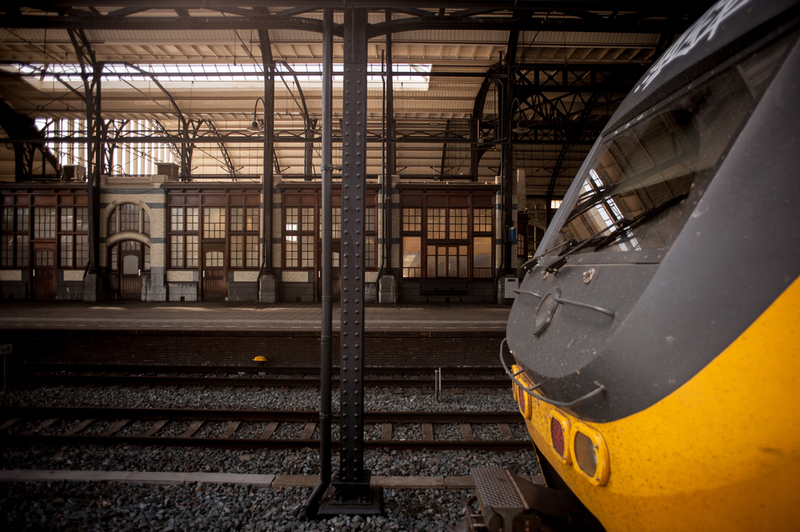 After walking quickly to Amsterdam’s central station from our apartment – we were all proud that we kept up with Chris’s pace that morning – we boarded a train headed to Haarlem. In classic fashion, most of us took a short nap during the fifteen-minute ride. Once we arrived in Haarlem, we walked to the center of town and had lunch at a cafe with a magnificent view of the St.-Bavokerk (“Bavo”), which would be our first stop of the day. 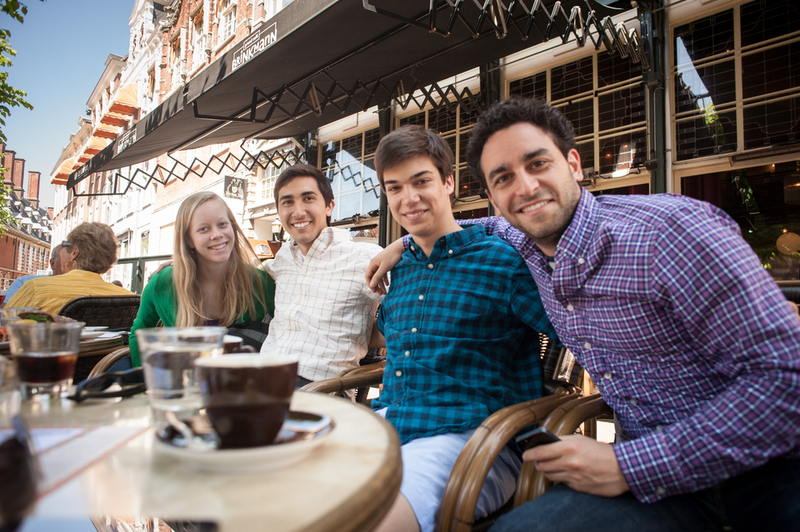 In keeping with the European tradition, the chairs at this cafe were oriented facing outward around the tables, so the ten of us sat in a line and people-watched while we ate our delicious meal. This was the third Christian Müller organ we have visited on our trip, dating back to the beginning of the 18th century. While Müller built the organ, the sculptor Jan van Logteren designed the ornate casework. 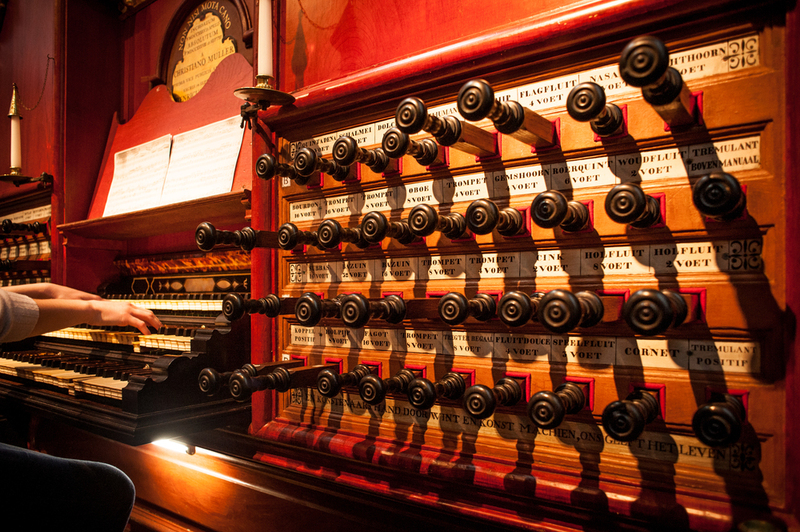 After three years of hard work, and many payments to workers in the form of food and wine at “The Golden Fleece,” the organ was ready to show off to the public and debuted in a service on September 14, 1738. 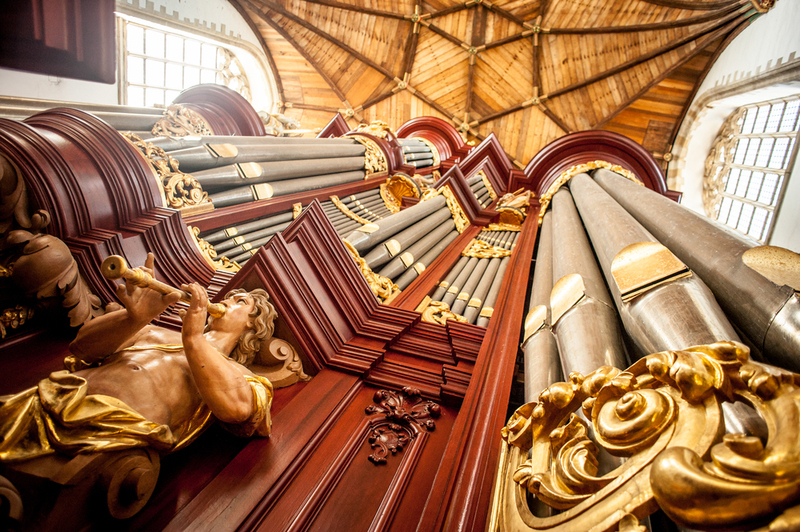 The splendor of the new massive organ in Haarlem spread around Europe, and even Handel and Mozart traveled to Haarlem to play it! 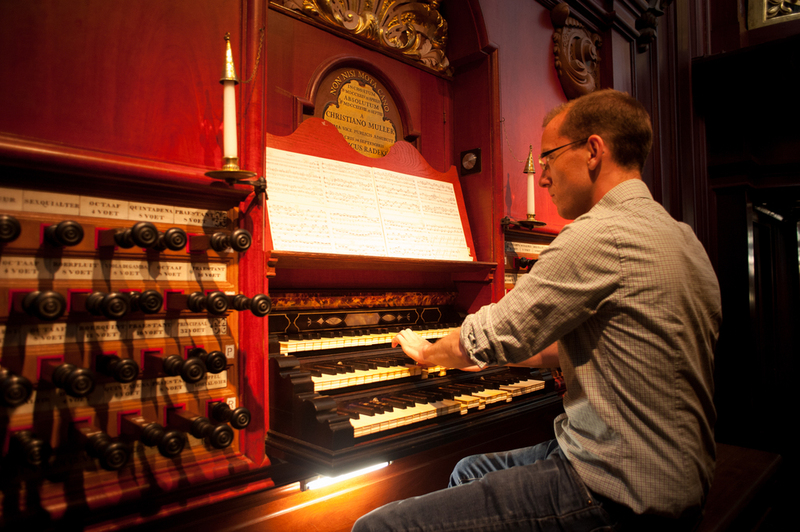 How cool is it that we can all now say we’ve played an organ that Mozart played when he was ten years old? 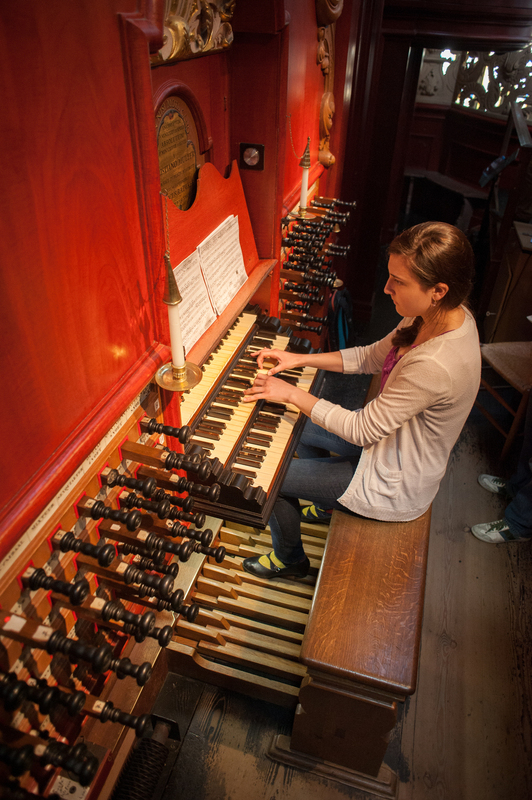 Most recently, the Flentrop organ company has been in charge of maintaining and tuning the great organ, the same company that built the lovely instrument we have in Adolphus Busch Hall back home at Harvard! 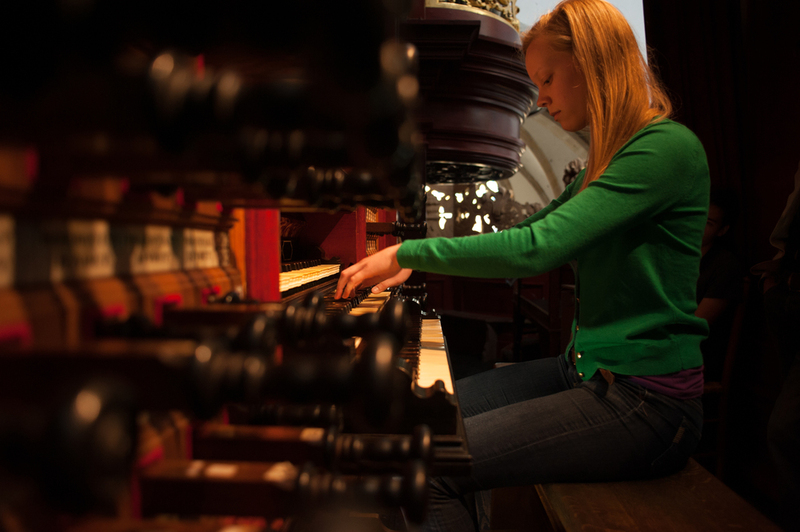 Jordan plays the Müller organ in Bavo. 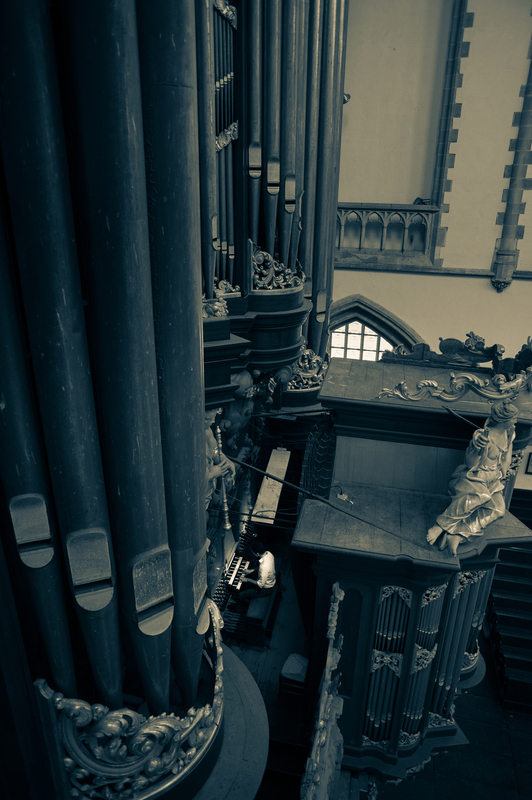 Noel plays the Müller organ. We each took turns at the console of the great organ and also had the chance to explore the church while we listened to each other play. 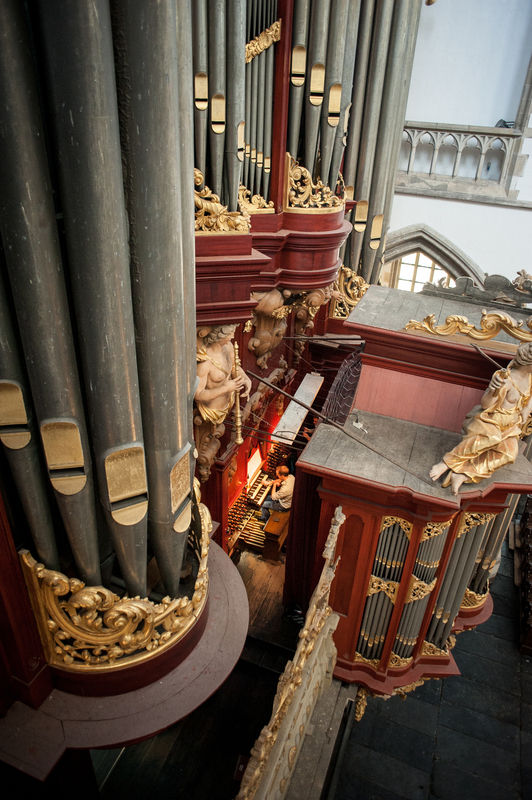 As wonderful as the organ sounded from the console, it was even more glorious to listen from below as the sound filled the space. Some of us even got to climb the rafters of the church and listen from the triforium balconies that were higher than the console! Such an amazing view of the organ and the church doesn’t come without a little work, though. 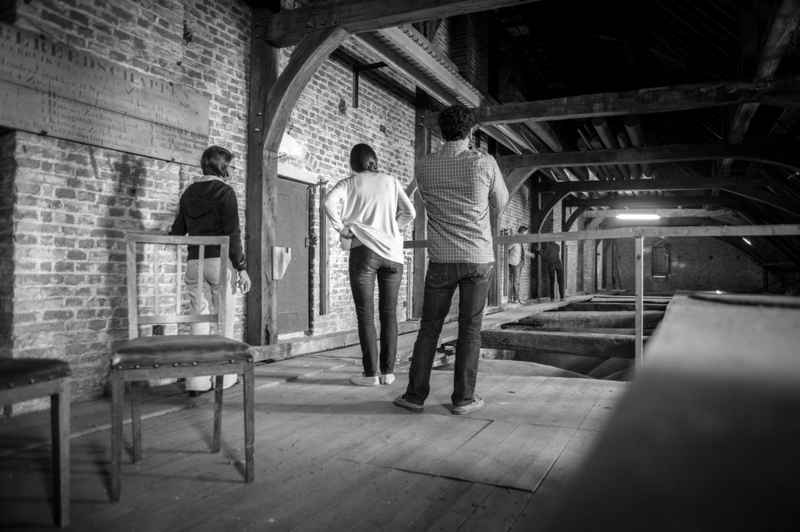 We had to climb up a tiny spiraling staircase and then walk across a single plank of wood, the only thing supporting us from falling several stories to the bottom of the church. For the adventurous souls among us, this was a breeze, but the rest of us were rather apprehensive as we gripped the wall for support and tried not to look down. Our relief upon making it onto the 2-foot-wide balcony did not last long, as Anton warned us that the railing would crumble into the church if we leaned on it. We could all agree, however, that it was an exhilarating experience and well worth braving fears of heights for this VIP access that mere tourists did not have! 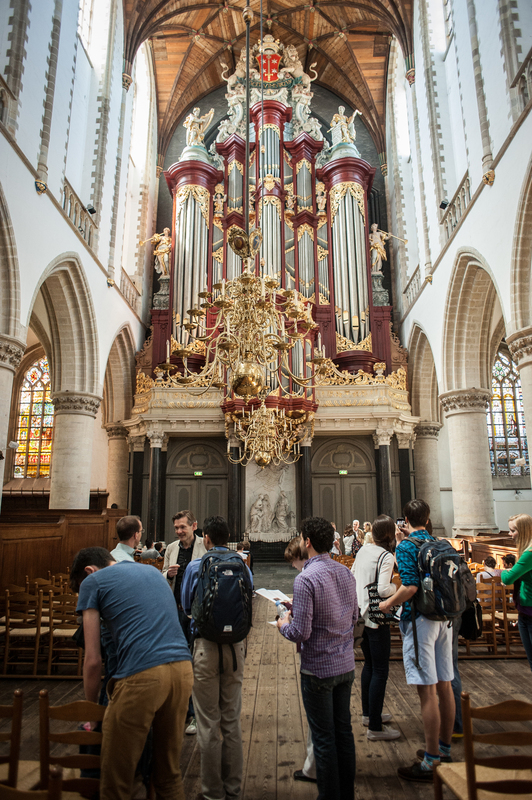 After two hours on the Bavo organ, we walked with Anton to the Nieuwe Kerk where we got to try out another van Covelens organ. 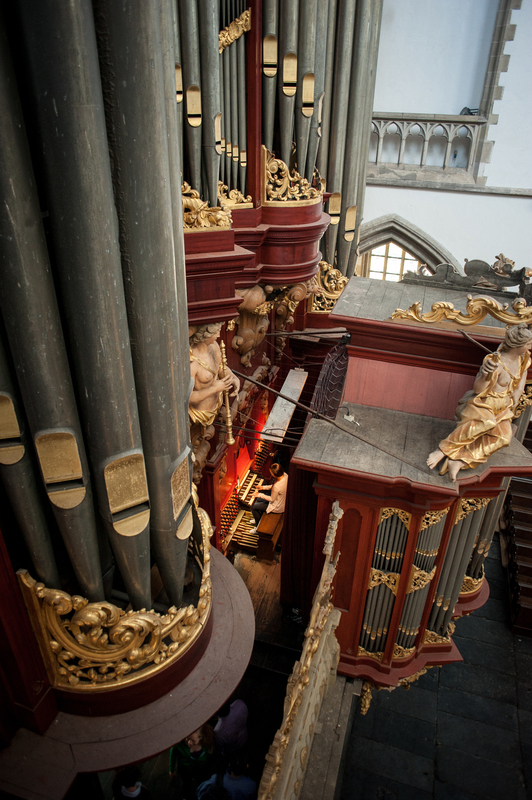 This organ is a modified version of a small organ that used to be housed in the St.-Bavokerk. 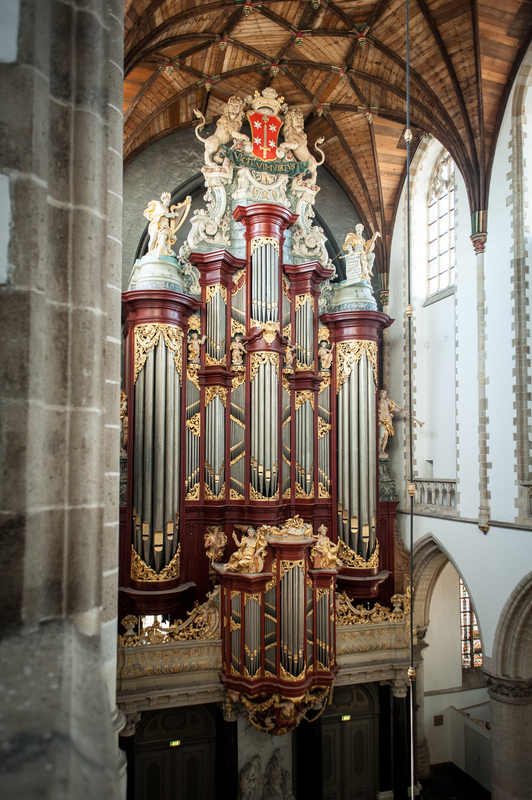 Organ accompaniment was not previously used in the Nieuwe Kerk until this organ was installed in 1791. 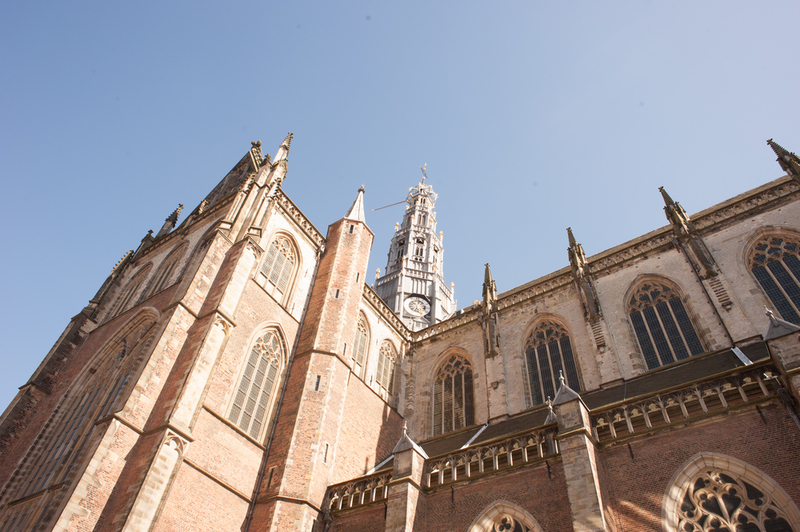 Today, the Haarlem tradition is that the Nieuwe Kerk serves as Bavo’s winter replacement — since Bavo gets too cold in the winter, its services are transferred to take place in the Nieuwe Kerk. 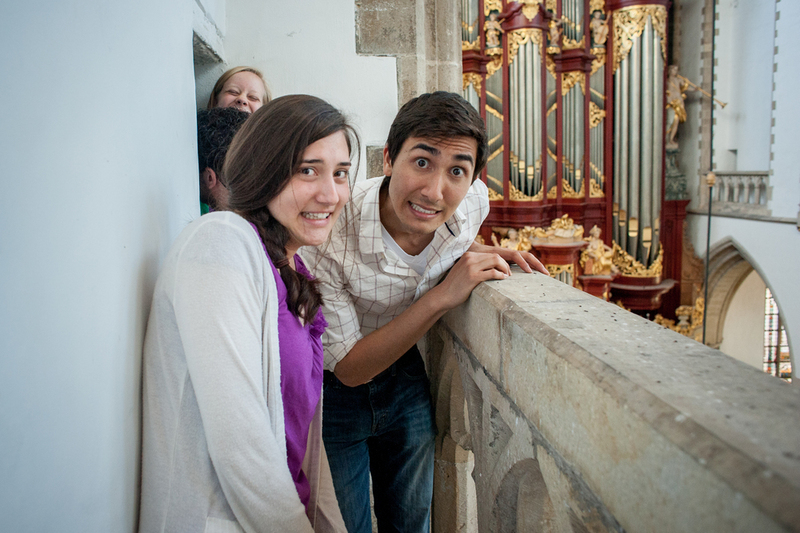 Again, here each of us had a chance to try out the organ. The selections we chose to play ranged from Sweelinck to Bach. We pose with Anton Pauw in front of the van Covelens organ in the Nieuwe Kerk in Haarlem. After saying goodbye to our wonderful host Anton at the Nieuwe Kerk, we sat down for a quick dinner in the main square in Haarlem before taking the train back to Amsterdam. Our day concluded with attending a fantastic recital at the Basilica of St. Nicholas. Michael Hedley, our host from the previous day, performed works of Tournemire, Ropartz, Rheinberger, Debussy, Planyavsky, and Howells. After the recital, we leisurely walked back to our apartment and resumed one of our favorite traditions: late-night snacking.